"During last year's inaugural season, popularity grew with each race as seen in the stands; through engagement levels online with the Nissan Micra Cup organization; and was heard on the showroom floor," says Joni Paiva, president of Nissan Canada Inc. "We are thrilled to keep that momentum going to get even more fans behind the series with the expansion of the Nissan Micra Cup to Ontario. Canada's most affordable race series, featuring the most affordable new car, the Nissan Micra, will launch its second season with minor modifications to the rules based on a survey completed by the drivers and their teams. Out of 16 races, the best results will be taken from 12 to tabulate overall standings. The qualifying session for one weekend is now split into two halves, one for each race. The Nissan Micra Cup race cars will no longer require spec fuel, and wheel camber setting will now be free. The driver return rate for the 2016 season is over 90 per cent. "One of the defining characteristics of the Nissan Micra Cup series is the diversity seen on the grid. Karting champions, racing legends, and rookies – they're all out there in identical Micras! This is a truly unique motorsport series for the masses, and it calls for expansion outside of Quebec," says Jacques Deshaies, owner of JD Promotion & Compétition and the series promoter. "Witnessing the camaraderie between the drivers and their teams in the paddocks was fantastic, but seeing the intensity of competition on the actual race track is exceptional - it gets very heated. This year, I am pleased to show Ontarians what high-intensity, spec series racing is all about, while also welcoming new drivers to the Nissan Micra Cup family." During the press conference at the Montreal International Auto Show, it was also announced that Total Canada has signed on as an official partner of the series for two years. After a successful season for the Total team in the Nissan Micra Cup, Total Canada will increase their participation through the partnership as the official provider of lubricant for the Nissan Micra Cup series. This Micra Cup Limited Edition is inspired by the official Nissan Micra Cup race car and sports a similar exterior appearance and 15'', 8 spoke, Nissan Micra Cup street edition wheels. Inside, this new model features a unique numbered plaque signed by Olivier Bédard, the first-ever Nissan Micra Cup champion. Only 250 units of the Micra Cup Limited Edition will be produced - available through Nissan dealerships in early spring 2016. "As the new president of Nissan Canada I am getting to know the country and specifically the people, so I appreciate the fact that our Micra-related news at the Montreal Auto Show this year revolves around one important group – the fans. 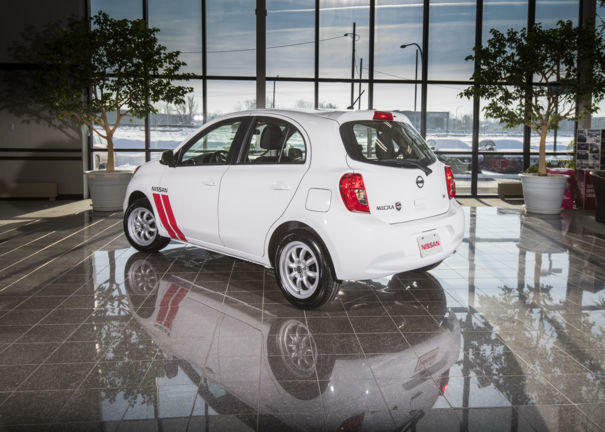 Canada's most affordable subcompact, the Nissan Micra, and Canada's most affordable race series, the Nissan Micra Cup, are developing a passionate following. I am delighted to offer enthusiasts of both the Nissan Micra and the Nissan Micra Cup a new model that brings a sense of spec series racing to public roads through the Micra Cup Limited Edition," concluded Paiva. Sanctioned by Auto Sport Québec (ASQ) and presented by JD Promotion & Compétition with the support of Nissan Canada, the 2015 Nissan Micra Cup exclusively featured the stock Micra 1.6 S M/T model with minor modifications, including NISMO suspension - to render it race-ready. Unlike most motorsport events, each competing Nissan Micra race vehicle had the exact same specifications, resulting in a competition that truly revealed the most skilled drivers. The 2015 Nissan Micra Cup race vehicles were equipped with the Nissan Micra's stock 1.6-litre DOHC 4-cylinder engine with dual fuel injection and Twin CVTC (Continuously Variable Timing Control) and stock 5-speed manual transmission. In its inaugural season, more than 25 Nissan Micras competed on each race weekend which included two hours of track time consisting of: a 30-minute trial, a 30-minute qualifying session and two 30-minute races. For more information on the Nissan Micra Cup, please go to the website www.nissan.ca/micracup.